On August 4th, the thief stole a tin wind-up toy robot valued at 250, 000 yen ($2,500) from a Mandarake store in Tokyo’s Nakano ward. 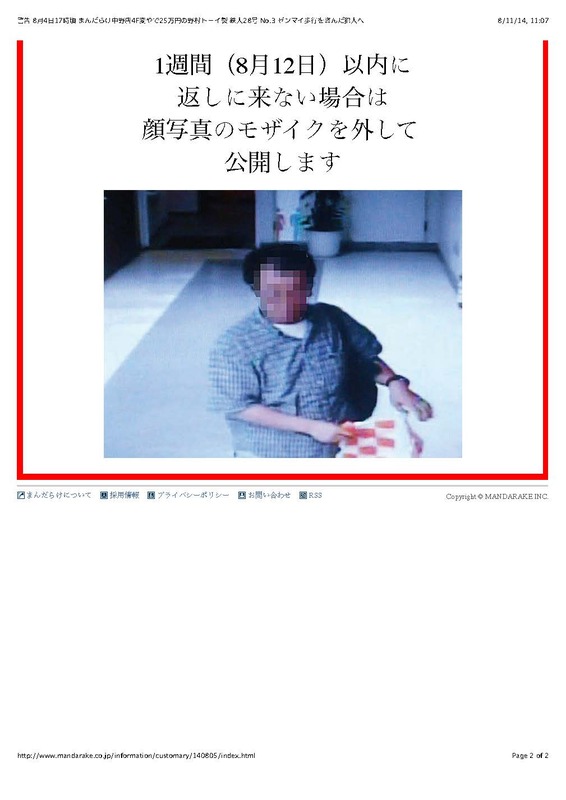 The company, Mandarake, which owns the store put up a public notice on its website which said that if the thief did not return the item within a week from the day it was taken (August 4th) they would show his face to the world. The deadline is midnight August 12th Japan time. The store already posted a blurred image of the man (taken from a security camera) on their web page (see picture) and if their demands are not met they will would remove the mosaic from his face and reveal his identity. The shop’s stunt raises questions of whether or not they are committing a crime themselves, amongst the legal community and has created a lively on-line debate. “Under the provisions of the Penal Code, it’s criminal intimidation if you threaten someone, even if it’s to take back a legitimate loan,” said Hisashi Sonoda, a criminal law professor from Konan University Law School, according to the Sankei Shimbun. A Tokyo police officer in the criminal investigative division told JSRC on background, “Technically speaking, the way the store is handling it could constitute criminal intimidation but no sane police officer would want to take that case. And I doubt any prosecutor would actually file charges. The wording of their warning could be a little better.” The detective also noted that if the store exposed an innocent man, they could be held liable for criminal defamation, which is a crime punishable with time in jail. In fact, even if the man is guilty, in some cases it could still be considered defamation under the current law. Despite the risks involved, the company intends to carry out their warning if the goods aren’t returned. Return Tetsujin 28 evil-doer and all might be forgiven. “We are really just hoping that the thief will return the stolen goods,” Masuzo Furukawa, the president of the company, told the JSRC via email. “Our basic principle is ‘condemn the offense, but not the offender,’ but if he doesn’t return the stolen item we will release his photograph and take actions to identify the criminal.” He said that they had footage of the suspect stealing the robot and there was no doubt that they had the right man. A source familiar with the investigation said that they suspect the suspect likely stole the figure because he is an avid fan who could not afford the doll but desperately wanted it. It would now certainly be an item hard to resell. 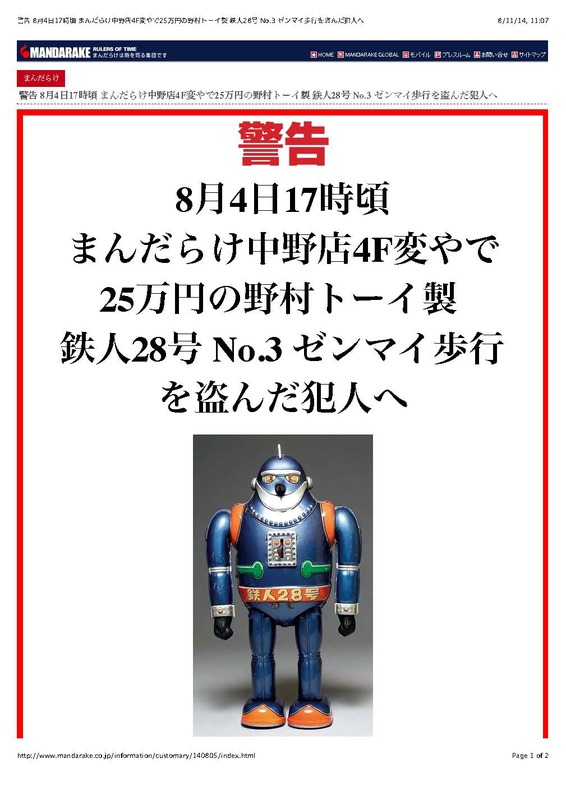 The toy is a model of Tetsujin 28. Tetsujin is a giant robot, who first appeared in a manga written and illustrated by Mitsuteru Yokoyama, which was popular in the 50s. In the original story, the robot was developed in the final days of WWII, by Japan’s Imperial army as a secret weapon to help the empire win the war. After the war, numerous heroes and villains fought for possession of the remote control that would allow anyone to use the giant robot, for good or evil. Finally, he comes under the control of a young private detective used Tetsujin 28 to stop crime and fight other robots. Sometimes, Tetsujin 28 and his boy master even worked with the Tokyo Metropolitan Police. Speaking of police, according to the National Police Agency, shoplifting in Japan is a persistent problem. Although shoplifting incidents have slowly decreased since its peak of 158, 020 cases in 2004, in 2013 there were 126, 386 cases that amounted to more than 2 billion yen in damages. There were 85, 464 people arrested in 2013. 37.7 percent of them were over 65. Many elderly cite economic hardships or debt as a reason for stealing, with many of the items being inexpensive items such as groceries and daily necessities. The plump young man in the photo released by Mandarake doesn’t appear to be starving. The hours are ticking away. Will the thief do the right thing and turn back in the toy—taking advantage of a generous offer—and follow the righteous path of a superhero and reform his thieving ways. If anything, he should at least be grateful that the owners of the store didn’t have a life-sized Tetsujin 28 robot hunt him down—because those days of killer robots may not be that far away. In any event, all will be revealed on by August 13th, and for one toy thief—this 13th may be a very unlucky day indeed. Update: Due to pressure from the police, “Mandarake” decided to not release picture of the male thief’s face, the Asahi Shimbun reported on August 14th. The Nakano Police Department allegedly said that the store’s threat and the media attention surrounding it “hindered the investigation” and they asked the shop not to make the suspect’s face public. A female claiming to be a friend of the male suspect also allegedly called the store approximately 7 P.M. and asked whether the store would really forgive the suspect if he returned the item by 8 P.M. No return was made. While the store was unable to carry out their own justice by unmasking the criminal the media attention surrounding the story serves as a warning to robot-stealing bandits everywhere. “We’re struggling to respond to everything. I think it raised a problem, but the response was greater than expected. From now on it will be difficult for us to respond by making the photo of the face public,” the Asahi Shimbun quoted public relations director, Katsuya Nakamura.